By combining supremely advanced fabrics and leading design techniques, Levity represents the pinnacle of performance in ultra-lightweight packs. Comfortable, supportive, ventilated and durable, these packs are built for the long-distance adventures where every gram counts.Levity 60 is designed with purely the essential features, in order to minimise weight and maximise performance. A large main pocket with top drawcord access is covered by a fixed lid, which features a spacious zippered pocket. A front pocket provides space to store and easily access spare clothing, while two side pockets will comfortably accommodate water bottles. Loops on the top, front and base can be used for lashing excess items to if needed. Levity features a fully ventilated AirSpeed™ suspended mesh backpanel, keeping you cool and comfortable on the trail. The ExoForm™ hipbelt and harness provide excellent padding and highly effective load-transfer into the body's strongest muscles.Advanced NanoFly™ material are used on the exterior of the pack in order to provide impressive durability and abrasion resistance. Non-exposed surfaces are built from 30D Siliconised Nylon, which provides an excellent weight-strength ratio. 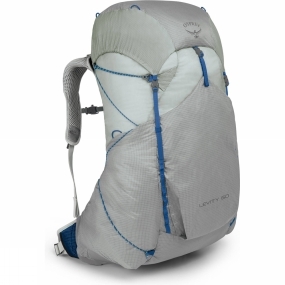 ?Levity 60 is compatible with all Hydraulics reservoirs and size Large Ultralight Raincovers.If you're looking for ultra-lightweight performance without the usual compromise, look no further than Osprey's Levity.